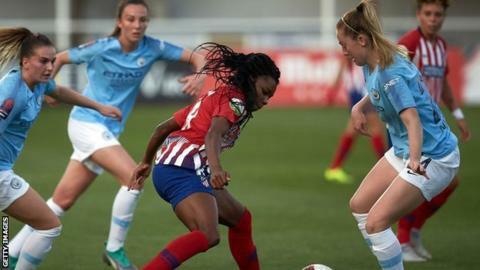 Manchester City Women were denied a superb away win after a late equaliser by Atletico Madrid in their 1-1 last-32 Champions League first-leg tie. Defender Gemma Bonner had nodded in a Caroline Weir near-post corner to give City a first-half lead, and Atleti cranked up the pressure in response. Amanda Sampedro and Ludmila Da Silva had efforts saved, while Elena Linari's header was cleared off the line. It seemed City had done enough but Kenti Robles' cross deflected in. The goal, with one minute of normal time remaining, was cruel after an impressive rearguard action from Nick Cushing's side but they will still take a precious away goal back to Manchester for the second leg. Victory would have been a fitting way to mark the century of appearances for Nikita Parris, who made her City debut as a loanee against Birmingham City in March 2015, but this was still a notable team performance. England goalkeeper Karen Bardsley had an inspired game against the Spanish champions, denying Sampedro and Da Silva with impressive stops, but could do nothing about Robles' cross which looped over and in. City mounted a few raids in search of a second, with Claire Emslie's shot flying just wide, but the two sides had to settle for the draw in the event. Atletico: Gallardo, Linari, Aleixandri, Menayo, Meseguer, Robles, Kaci, Angela Sosa, J. Hermoso, Sampedro, Ludmila.